Modeling the conformational changes that occur on binding of macromolecules is an unsolved challenge. In previous rounds of the Critical Assessment of PRediction of Interactions (CAPRI), it was demonstrated that the Rosetta approach to macromolecular modeling could capture side chain conformational changes on binding with high accuracy. In rounds 13–19 we tested the ability of various backbone remodeling strategies to capture the main-chain conformational changes observed during binding events. 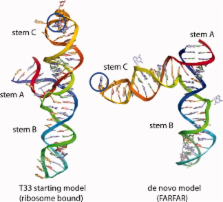 These approaches span a wide range of backbone motions, from limited refinement of loops to relieve clashes in homologous docking, through extensive remodeling of loop segments, to large-scale remodeling of RNA. Although the results are encouraging, major improvements in sampling and energy evaluation are clearly required for consistent high accuracy modeling. Analysis of our failures in the CAPRI challenges suggest that conformational sampling at the termini of exposed beta strands is a particularly pressing area for improvement. Proteins 2010. © Wiley-Liss, Inc. Protein homology detection by HMM-HMM comparison. Protein homology detection and sequence alignment are at the basis of protein structure prediction, function prediction and evolution. We have generalized the alignment of protein sequences with a profile hidden Markov model (HMM) to the case of pairwise alignment of profile HMMs. We present a method for detecting distant homologous relationships between proteins based on this approach. The method (HHsearch) is benchmarked together with BLAST, PSI-BLAST, HMMER and the profile-profile comparison tools PROF_SIM and COMPASS, in an all-against-all comparison of a database of 3691 protein domains from SCOP 1.63 with pairwise sequence identities below 20%.Sensitivity: When the predicted secondary structure is included in the HMMs, HHsearch is able to detect between 2.7 and 4.2 times more homologs than PSI-BLAST or HMMER and between 1.44 and 1.9 times more than COMPASS or PROF_SIM for a rate of false positives of 10%. Approximately half of the improvement over the profile-profile comparison methods is attributable to the use of profile HMMs in place of simple profiles. Alignment quality: Higher sensitivity is mirrored by an increased alignment quality. HHsearch produced 1.2, 1.7 and 3.3 times more good alignments ('balanced' score >0.3) than the next best method (COMPASS), and 1.6, 2.9 and 9.4 times more than PSI-BLAST, at the family, superfamily and fold level, respectively.Speed: HHsearch scans a query of 200 residues against 3691 domains in 33 s on an AMD64 2GHz PC. This is 10 times faster than PROF_SIM and 17 times faster than COMPASS. The guanine nucleotide-binding switch in three dimensions. Guanine nucleotide-binding proteins regulate a variety of processes, including sensual perception, protein synthesis, various transport processes, and cell growth and differentiation. They act as molecular switches and timers that cycle between inactive guanosine diphosphate (GDP)-bound and active guanosine triphosphate (GTP)-bound states. Recent structural studies show that the switch apparatus itself is a conserved fundamental module but that its regulators and effectors are quite diverse in their structures and modes of interaction. Here we will try to define some underlying principles. Advances over the past few years have begun to enable prediction and design of macromolecular structures at near-atomic accuracy. Progress has stemmed from the development of reasonably accurate and efficiently computed all-atom potential functions as well as effective conformational sampling strategies appropriate for searching a highly rugged energy landscape, both driven by feedback from structure prediction and design tests. A unified energetic and kinematic framework in the Rosetta program allows a wide range of molecular modeling problems, from fibril structure prediction to RNA folding to the design of new protein interfaces, to be readily investigated and highlights areas for improvement. The methodology enables the creation of novel molecules with useful functions and holds promise for accelerating experimental structural inference. Emerging connections to crystallographic phasing, NMR modeling, and lower-resolution approaches are described and critically assessed. Copyright statement: Copyright © 2010 Wiley-Liss, Inc. Performance of ZDOCK in CAPRI rounds 20-26. Analysis of antitumor activity of an interleukin-13 (IL-13) receptor-targeted cytotoxin composed of IL-13 antagonist and Pseudomonas exotoxin.